The Apple TV is one of the most competent set-top boxes you can find, and has sneakily become one of Apple's most important offerings. 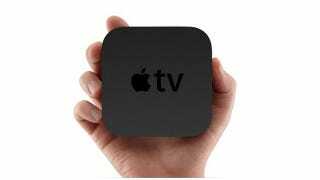 But as good as it is now, the Apple TV has also always been about potential; the company's long been in negotiations with content owners to provide channels as apps, an a la carte streaming future that would liberate us from cable companies forever. That was the plan, anyway. But a Wall Street Journal report indicates that Apple's brilliant streaming future may be dead, with a boring old business-as-usual cable. It's a classic "can't beat 'em, join 'em" story, and it's terrifically disappointing to hear. According to the WSJ, Apple's negotiations have shifted from licensing content on its own to compete with US cable operators to selling a cable box through which cable subscribers could consume their regular content. Basically replacing your ScientificAmerican set-top box with a device you buy straight from the Apple Store instead of renting from TimeWarner. "Apple spokesman Tom Neumayr declined to comment on what he characterized as rumors and speculation," the WSJ reports. On the one hand this seems almost radical; asking consumers to cough up a few hundred dollars for a cable box (when they're used to just renting, and when the current Apple TV streamer costs just a hundred) would require a major ideological shift for most people. But however different that business model is from what you're used to, it pales in comparison to how dramatically Apple's original streaming plans would have changed how television works. If it's just more of the same, then, why would Apple bother getting involved in the first place? To get a firmer foothold in your living room that a streaming puck can, for one. To start a traditional relationship with cable companies that can hopefully evolve into something more radical. And to give you a decent-looking onscreen TV guide for a change, I guess?